Happy Friday everyone! Sorry for the late post today, but Binx had his yearly vet visit this morning and then I went out kayaking since the weather is gorgeous!! 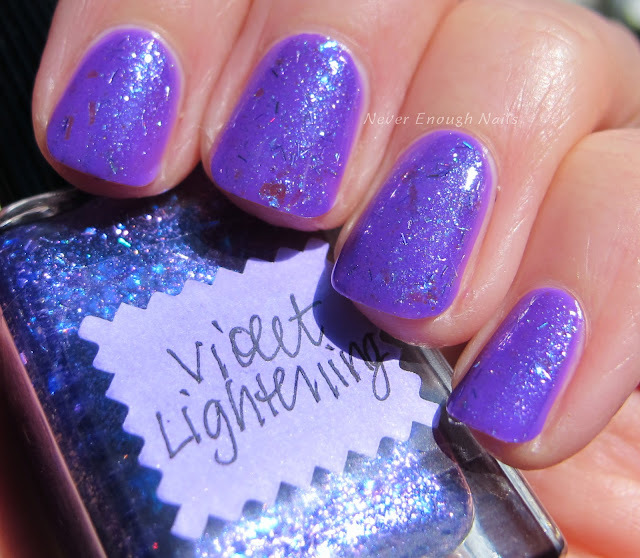 Speaking of gorgeous, I have some more Lynnderella pretties for you today, starting off with Lynnderella Violet Lightening. 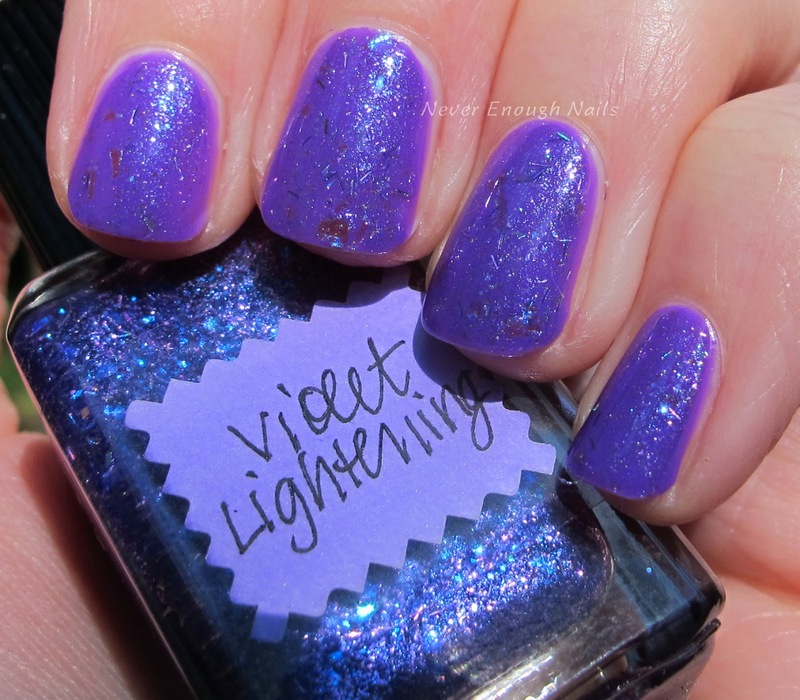 Violet Lightening is a complex mixture of different flake glitters, including holographic lilac and blue flakes, with microglitter accents and tons of shimmer in a blue-violet base. There are some teeny micro bar glitters in this one, so I wasn't sure how much I'd like it, but on the nail they just look like pretty holo sparkles. They also sit very flat and smooth on the nail. 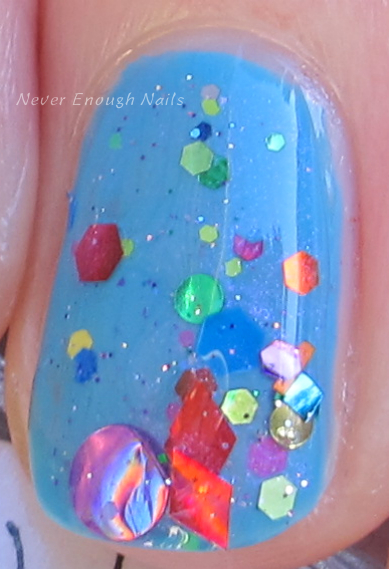 The intense blue shimmer mixed with the iridescent flakies is a really great look. For these pictures, I used one coat of Violet Lightening over China Glaze Plur-ple. It was easy to apply and packs a big punch with just one coat layered over a base color. I used one layer of top coat to finish off this mani. The "Piffle" series is a new favorite Lynnderella grouping of mine. I was super excited to see Lynnderella Piffle, Coral... in the package this week. Piffle, by the way, means "nonsense". 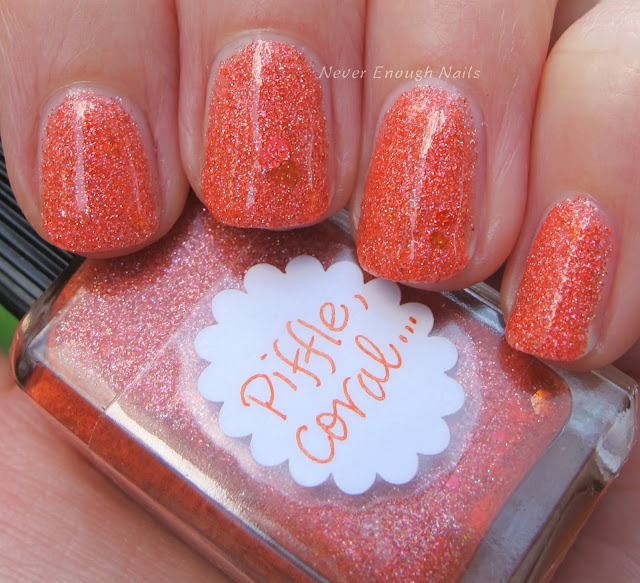 Piffle, Coral... is a coral microglitter with a translucent coral base and some larger coral glitter accents. I haven't ever seen a coral microglitter polish before and this one is stunning! The coral microglitter is holographic and really sparkles in the sunshine. It's an orange-y coral for sure, but you can see hints of pink in person. This is a perfect summer polish! This is two coats of Piffle, Coral... The opacity is great and there were no bald spots or problems applying. The formula was maybe a tad thicker than some Lynns, but I didn't find it to be hard to use at all. This is with one coat of Essie Good to Go on top. Be still, my chunky glitter topper loving heart! 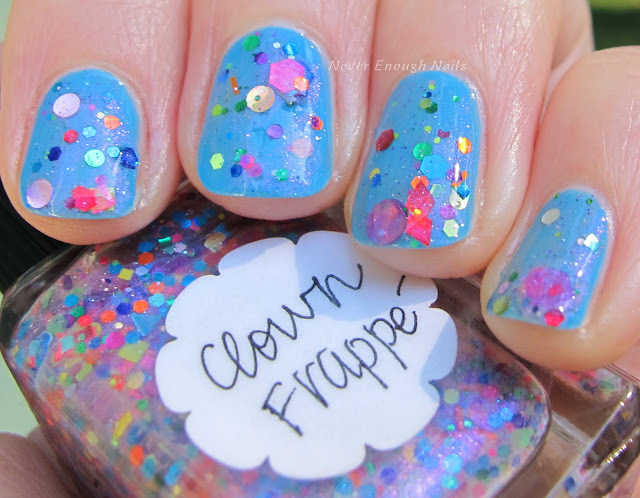 Lynnderella Clown Frappe is party for your nails, featuring a great assortment of glitters in red, pink, green, blue, yellow and several other colors. There are large holo pink circle glitters, red diamonds, smaller green circles, and many more shapes to be found. Clown Frappe has a clear base with tons of pretty pink shimmer. Although I am growing more and more fond of Lynnderella's microglitters all the time, her toppers are still my absolute favorites! I've already got plans to make this my birthday mani (my birthday isn't until November, haha!). This is one dabbed coat of Clown Frappe over Sally Hansen Dive Bar. It was easy to apply using the dabbing method and the glitter is quite plentiful, but the polish doesn't seem thick or chunky at all. 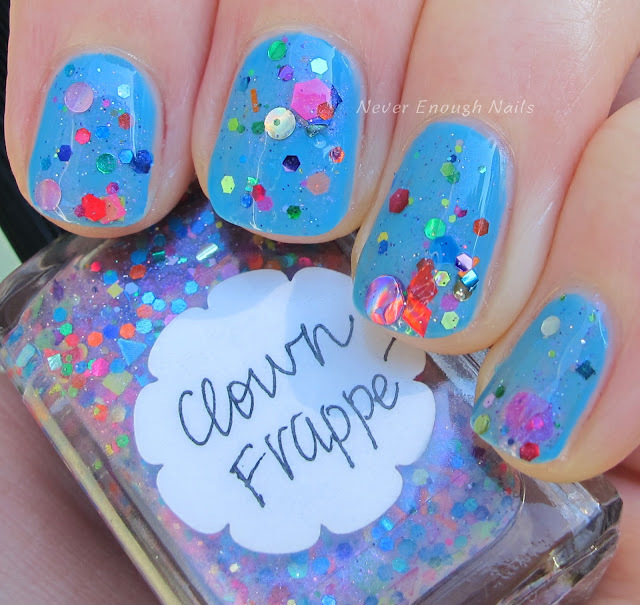 Clown Frappe is a great name, it cracks me up! Lynnderella polishes are available at Lynnderella.com and lynnderella.storenvy.com. I know Clown Frappe is still available (although I don't see it on lynnderella.com), so you can always email Paul to ask. Check out Lynnderella-lynnderella.blogspot.com for more info and like Love Lynnderella on Facebook for swatches and news!